A few weekends ago, I wrote myself a note, reading “Jose Bautista — oppo.” I watched Bautista hit a home run to right field in Yankee Stadium, and I figured that might be the sort of thing worthy of a post. Bautista generally clobbers his dingers to left, and I thought maybe there could be something there. I thought also that maybe, just maybe, Bautista had a history of going out to right field in New York, which has maybe the most forgiving right field in baseball. Ultimately, I didn’t do anything. I mean, I eventually did some research and played with some numbers, but I didn’t have enough for a post. Not a post that anyone would care about. Stupid me — I was watching the wrong player. Genius me — I at least had a decent general idea. Rare opposite-field home runs? Potentially interesting. And while I didn’t get enough of interest on Bautista, it wasn’t much later that Brian Dozier pulled off a career first. I have to apologize for the lack of timeliness; this is a post about an event from last Wednesday. I don’t know why I didn’t notice sooner. But last Wednesday, facing Corey Kluber of all people, Brian Dozier stepped in and, in a 2-and-1 count, hit a home run down the right-field line. It’s actually been a rough second half for Dozier. He was on fire through May and June, but since then he’s gotten worse in each month. Sometimes slumps happen, and as exploitable as Dozier’s approach seems to be, it’s not like pitchers just noticed. This is probably less simple than people give it credit for. But anyway, Dozier’s September wRC+ is 74. He has to his name just two home runs. Earlier this season, Dozier hit his first-ever homer to the right side of straightaway center field. Compared to his track record, that was an exceptional homer. But then there’s that other one, from last week. That’s a truly exceptional homer. Dozier, earlier, hit a homer up the middle. This one, he hit to extreme right. The key, apparently, was just sitting back a split-second longer. I didn’t notice anything different about Dozier’s swing, except for the timing, waiting longer than usual to pull the trigger against Kluber’s delivery. When the ball left the park, Dozier’s own manager was surprised. Teammate Trevor Plouffe couldn’t quite believe it, either. We have splits at FanGraphs going back to 2002. Since then, 417 different players have hit at least 50 home runs. As a group, they’ve hit 11.5% of those home runs to the opposite field. Dozier used to stand at 0.0%. Now he’s at 1.3%, sandwiched between Jimmy Rollins and Aaron Hill in 377th place. He’s left behind the group of o’fers, led by Mark Ellis (105 total homers) and Melky Cabrera (100). Now Dozier finds himself in different, albeit very similar company. Regarding Dozier going the other way, you can no longer say it’s never happened. It’s most remarkable to see Dozier get an opposite-field home run. It’s a lesser degree of remarkable to see Dozier simply get an opposite-field hit, especially one for extra bases. It’s not just his power that’s historically been confined to left and left-center — it’s just about all of his offense. When Dozier arrived in the majors, he adjusted to become pull-heavy, which is how he found success. Between 2012 – 2014, Dozier’s opposite-field wRC+ was actually negative. Over those three years, 351 players hit at least 100 balls to the pull side and at least 100 balls the other way. Dozier’s isolated power dropped off by 331 points, between them, the 10th-biggest difference in baseball. His wRC+ dropped off by 237 points, the second-biggest difference in baseball. Only Jonny Gomes showed a bigger difference between his pull-side success and his other-way success, and Gomes couldn’t compare to Dozier’s playing time. Used to be, if you could get Dozier to go to right, it would be almost an automatic out. This year, his wRC+ the other way is 42, and while that’s most assuredly not good, it’s better than last year’s -24, and the previous year’s -19. Before this year, Dozier had seven opposite-field extra-base hits. This year, he has six. I want to repeat: these numbers are bad. 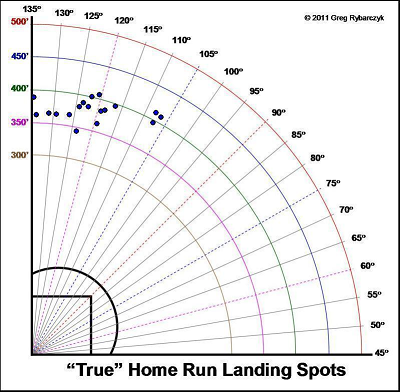 These are still the numbers of a fairly extreme pull hitter. But the Twins would like to see Dozier do more to right and right-center. They figure it might be his next step, a way for him to avoid extended slumps like the one that he’s in. By focusing on left field, Dozier’s timing has to be both quick and perfect. Maybe he will get better to the opposite field. Maybe he already has, and he’ll continue to improve as he develops. Maybe this’ll prove to be as meaningful as that first opposite-field home run that Mike Moustakas hit. Maybe it won’t — there’s a long way to go. There are more hits to accumulate. Based on the ESPN Home Run Tracker, Dozier’s opposite-field homer was his weakest homer of the season. In half the parks in baseball, it’s estimated it wouldn’t have gone out. Which means, in half the parks in baseball, this would’ve been something else, and this post wouldn’t exist. But what happened happened. The almost-impossible proved not literally-impossible — Brian Dozier hit a home run down the right-field line. Maybe that’s going to mean something going forward. It already means something looking back. We hoped you liked reading A First for Brian Dozier’s Career by Jeff Sullivan! 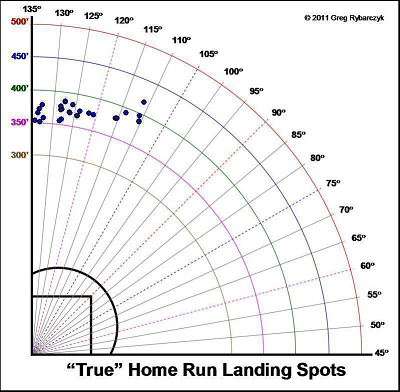 How many standard deviations away from the mean angle was that homerun?